Highest-risk merchants often have the hardest time finding a company willing to provide acceptance to handle credit card payments. Any store looking to accept credit card payments must have a processing company who will provide them with an account, this is the way things work. Before you can accept American Express, Discover, MasterCard, or Visa, you must find a company who is willing to grant you a merchant account. Click here for more information on high volume merchant services. Before you can accept credit cards, you must have an organization willing to offer you an account. If you accept credit card payments, you generally receive your payment for the item from the credit card company within three days. If your customer because dissatisfied with the product after this, you are required in many cases to provide a refund. American Express, Discover, MasterCard, and Visa need to know you will responsibly return their client’s money and this is where your merchant processing bank comes in to the picture. They act as the representative who guarantees you will pay back the money as promised. All higher-risk businesses involve high priced items or products/services that are risky to buy because they do not work for everyone or can be deemed as a rip-off in the public’s eyes. If this is the service or product you are offering, you will be able to find credit card processing support, but it usually comes with much higher fees. 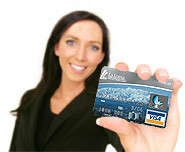 On a typical merchant account, the fees are generally 1.5 to 2% of the credit card charge. On top of this, many merchant processors charge a $5 to $10 monthly fee to provide a business with a statement of their charges and charge reversals. Transaction fees of 10 to 35 cents are also required to cover the cost of transmitting the charge to the credit card company. Finally, most credit card companies require a store or internet website to pay a minimum amount every month. If fees only come to $18 and the minimum amount is $25, you will pay that $25 regardless. You should also check with your merchant processing company and ask about annual membership fees, early termination fees, and customer service fees, as many companies require business owners to pay these. With higher-risk merchants, these credit card transaction fees can be triple what the average merchant pays. Instead of paying up to 2% for credit card purchases, you may be paying 5% to 10% in fees. You will also have higher annual fees, customer service fees, minimum payments, and transmission fees. It is critical to shop around for the lowest rates when starting up a business because the fees may become too expensive otherwise. Charge backs are another major issue with credit card purchases. If a customer believes his or her credit card was used fraudulently or can’t remember making a purchase, they will advise their company to remove the transaction immediately. Unlike a refund, a charge back is usually used in case of theft and the company who processed the transaction is charged a higher fee and penalty of up to $50. Charge backs are costly and the one thing that any company wants to avoid! With this in mind, charge backs usually occur with online transactions where no signature is required. If you can set up a system where you are using the card’s three-digit security code or requiring a signature, you can avoid most charge backs. We specialize in placing higher risk businesses. Use the link above to fill out the form and we will follow up with you as quickly as possible. We can give you an accurate rate quote only after you apply and we know the nature of your business.